Are you looking to add the ultimate extra room to your home? 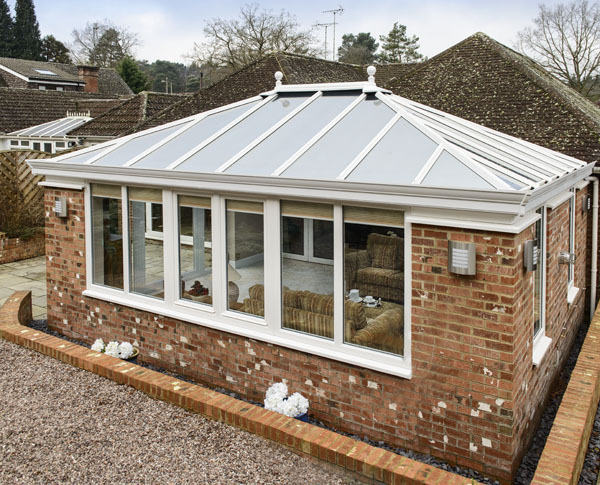 Well, did you know we do orangeries as well as conservatories? These could be just the type of room you want for your home; it brings in light as well as increasing your living space and it looks spectacular! An orangery is a brick built building with large windows and a glass roof. So what is this new design you say? Well, instead of having a traditional orangery style roof, where the brick walls are higher than the pitched glazed roof, you can have a glazed roof that meets the edge of the orangery walls. This clever and attractive new style uses an external aluminium parapet. So instead of a brick parapet, the roof is finished with an aluminium cornice and gutter that sits on top of the walls, hiding the gutter and the end of the glazing bars. This clever new style creates a clean and decorative line between the roof and the wall frames. The inside of the conservatory hasn’t changed despite this new style. You still have the beautiful interior pelmet bordering the top of the walls in the orangery, where you can install lights or even speakers, hiding away the wiring too. Enough talk! Pictures speak a thousand words, so just see for yourself and let us know if you want one and what you would use it for!